USE EMA -5(LOW) and EMA-5(High) instead of using 5 EMA. 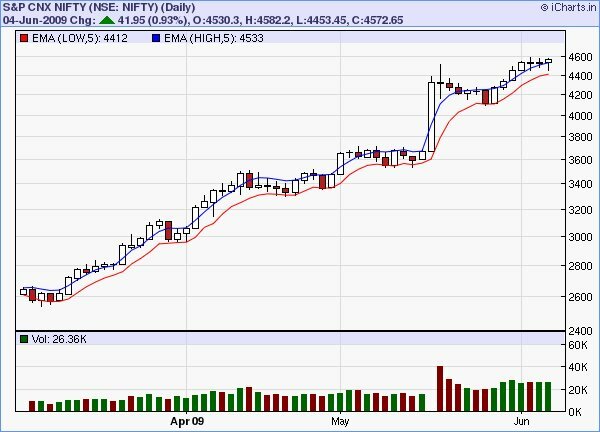 Rest its good to look at the 3 month Nifty chart with 5 EMA(High – Low) Indicator. Dear, Can u plz guide me how to calculate 5 EMA HIGH & LOW.From charts I can get 5 EMA value but where can I get High & Low for 5 EMA. eg: 5 EMA value for NIFTY FUT(JUNE4) is 4508 (JUNE 4 closing is 4582).How can I calculate 5 EMA HIGH & LOW.THANKS IN ADVANCE. Thanks Rajandran I will try this strategy. Sorry im new to trading, are those values suppose to ema -5 (low) and ema +5 (high). Or is it suppose to -5 and -5 for both high and low.How does that happen? in amibroker this can be set . this strategy also works in intraday. by anay chance cha i have AFL code for EMA crossover 3 and 15 plzzzzzzzzz. How to set EMA High, Low in I charts? in icharta, u can not put EMA Hi/Lo in java (J-charts). But you can plot them in Charts Premium. Don’t have an idea regd Platinum charts. Is there any afl for the above? We are at terrible point. At were it is written take previous value of ema to calculate new value of ema based on current closing price. we are stuck. THe first value which is Moving avg of N period is the starting point for calculating the EMA for next value. We tried the universal formula. But value are not matching. We are not able to match the numberrs, that are avaible in charting package like sharekhan to calculate 5 ema and 10 ema. We cant afford to buy expensive charting package to test the module. Kindly help and reply in my email soon. How to calculate high and low EMA? could u plz tell me if we apply stoploss with 5ema then why there is more loss.